i handed in the manuscript for my friggin cookbook!! cookbook. i’ve been working on this with every little bit of free time i’ve had over the past year. i am most definitely NOT one of those people that can procrastinate and then spend the week before something is due just staying up all night to get it done. no way. instead i have been steadily chipping away on this puppy since i first got the book deal last fall. and by golly, when November 8 rolled around i had 50 recipes, 50,000 words, and a big weight off my chest. we will be photographing the book in the Spring, and it should be out by next Fall. i still can’t really believe it, but it is TRUE. thanksgiving. 500 loaves in 3 days. first of all – T H A N K Y O U to all of you wonderful folks that chose to spend your Thanksgiving with me, i was beside myself with joy that so many people wanted my bread. makes me even more pumped for what’s to come. but 500 loaves!!! now i know that this is child’s play for most “bakeries,” but dudes, i ain’t most bakeries. silly (or stupid) enough, i had actually planned on doing it all by myself. i woulda been fully effed if i’d stayed the course, so thank the almighty bread gods that my main man Ryan (one of the handsome and talented bakers who will be on the starting JBB crew at The Mill) and main lady Wendy (our ridiculously hard-working and talented head baker) came to the rescue. 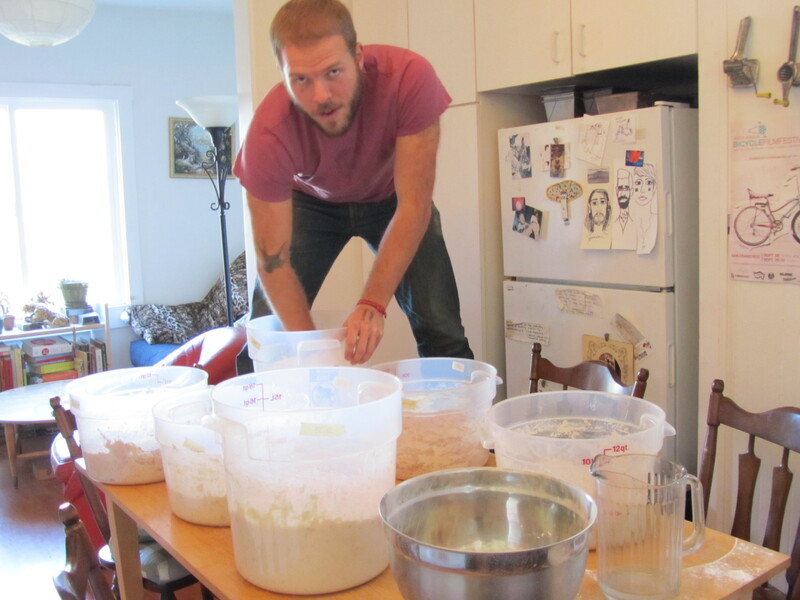 you’re probably all like, “what’s the big deal, 500 loaves, stop whining baker boy.” i’m not whining, i’m just sharing… we hand mixed it all. so ha! yeah, we hand mixed it all in little tubs and then shaped it into breads and then i baked those suckers. i heard people liked em, and that warms my heart. oh yeah, The Mill will be open December 30. get ready to party. 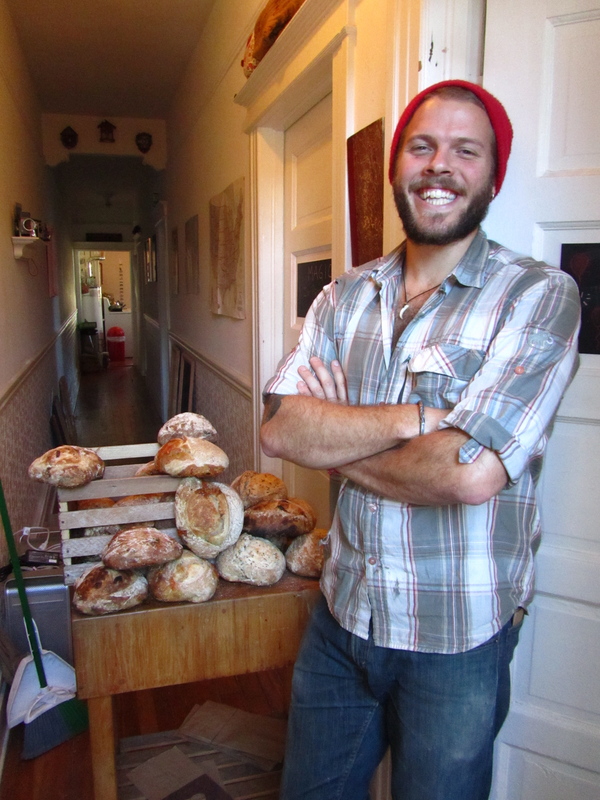 it’s crazy – two years ago i got a little article written about me in a food newsletter and 30 people showed up at my door on Thanksgiving morning to buy my bread. well, i’m doing it again this year, but i’m going to be a bit more… professional about the whole thing. i’m now accepting pre-orders for Thanksgiving bread. you can order to pick up the day before, or the morning of, it’s up to you. all breads are $6/loaf, available by pre-order only. what do i think you should do? order for pick up on Thanksgiving morning, and then come hang out with me at The Mill, grab your bread, have a cup of coffee, and be eternally thankful for the miracle of life. then stuff yourself and take a nap. if all this pre-order stuff is too much for you to handle, then worry not! i will also be selling bread at Bi-Rite Market on Tues & Wed the week of Thanksgiving. bread everywhere, so awesome.